Ask A Filipino! : What did Pasig officials smoke to come up with their brilliant slogan? Thank you for bringing this to my attention. This slogan is indeed very impressive and officials from other Philippine cities would be well-advised to take note of its sheer brilliance. In order to come across even just half as methodical as the Pasig City executives who conceptualized and executed this phenomenal slogan, I will apply a two-step approach in answering your question. First, I will attempt to describe, despite my obvious limitations, why the slogan is perfection exemplified. Second, I will reveal to you exactly what to "smoke." Any marketing and advertising executive worth his salt will tell you that for you to come up with a great slogan, you have to do your homework, define your niche, define your goals, be creative, and think "memorable". Pasig officials obviously did their homework here. It is manifestly clear that they were fully aware that while Pasig used to be a residential and industrial city, it is increasingly becoming a growing commercial area and is now the country's eighth largest city in terms of population. Further, it is impossible to think that they were oblivious to the fact that Pasig is home to prominent institutions like the Philippine Stock Exchange, the Integrated Bar of the Philippines, The Medical City, University of Asia and the Pacific, ULTRA (now the PhilSports Arena), and the Ortigas Center; additionally, it is also the headquarters of top corporations like San Miguel and Meralco. Because Pasig has these aforementioned institutions and companies as residents, the city obviously needed to convey a slogan that screams "cutting-edge," "international," "global," and "open for business," right? You betcha! "Sige" is THE action word that is exactly calibrated for this goal. While it is a Tagalog word which means "to continue" (whatever it is that Pasig does), nobody can miss the double entendre here. After all, everybody knows that "sige" also means "to act, play, or perform" in Yipunu, which is a Bantu language spoken by 50,000 people in Congo and the Tchibanga region of Gabon. Repeat the word twice in one line, "SIGe...SIGe PA," and -- voila! -- you have a major, major slogan that is super, super memorable! But, of course, in any great slogan, "the art is in the details." Notice: "SIGe...PASIG...SIGe PA" has a pallindromic ring to it -- which, if you've read the latest copy of The Economist, should complement 2011. And lest there be any doubt that "SIGe...PASIG...SIGe PA" is a slogan, Pasig officials made sure it is surrounded by quotation marks. Exquisite, don't you think? 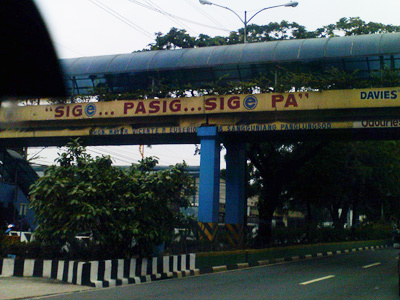 The two ellipses surrounding PASIG, meanwhile, adds a never-ending effect to the phrase ("SIGe...PASIG...SIGe PA...SIGe...PASIG...SIGe PA...SIG?") -- definitely not unlike the mathematical constant π (sometimes written pi), which, as an irrational number, cannot be expressed exactly as a fraction. The rationale behind the triple-dot glyph was not lost, I'm sure, on the Pasig executives. Of course, one could also be tempted to think that the SIGe in the slogan refers to silicon-germanium (SiGe), which is an alloy commonly used as a semiconductor material in integrated circuits for heterojunction bipolar transistors, and he/she would not be far off. After all, the slogan exudes high-tech -- think eCommerce, eBusiness, et cetera. Except of course that the e in SIGe, unlike the three letters preceding it, is not just in lowercase but is also -- note closely -- encircled! Now this, my friend, is simply genius at work! Now, tell me: Do you know of any government officials in the world, aside from those who run Pasig, who ever put this much mathematical thought and creative effort into a city slogan? (4) Inhale the steam coming from the boiling Pasig water. the wiseman is most impressed with the pinoy. it might interest the pinoy to know that (1) the previous and current city mayors' last names are both "Eusebio" and (2) in addition to the other cottage industries that it hosts, Pasig is also home to quite a significant number of motels. the wiseman is enjoying referring to himself in the third person. (b) the pattern found in "SIGe...PASIG...SIGe PA" which is similar to "YO...SEB...YO"
are subliminal reminders to Pasiguenos "to continue" to vote in a "eUSEBIO" every election time! Because if that is indeed the case, we might as well replace the term "Machiavellian" with "Eusebian"! Really -- that would be, like, "W...O...W"! As to your motels factoid, is that assertion supported by statistics (e.g., motel room per capita) or is that from your personal experience? Where I come from, we pronounce that name "YU...SIB...YU"! Maybe the Americans are involved in that slogan? "SIGe...PASIG...SIGe PA" has two e's. But if you write it as eUSeBIO, you find what? Between the two e's of the mayors' last name is "US"! Then "US" is followed by "BIO" -- the acronym for the Biotechnology Industry Association based in the US! you are beginning to scare "mee"!